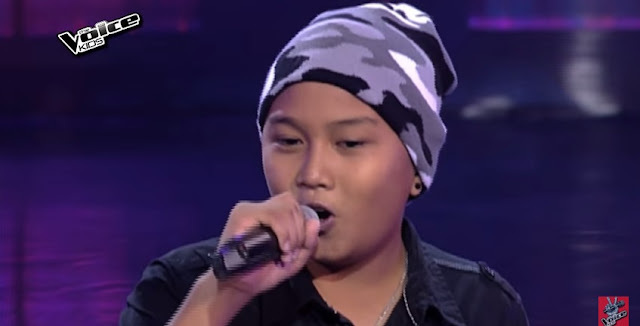 MANILA, Philippines - Thirteen-year-old kid rocker Owen Fernandez impressed Coach Sarah Geronimo and Lea Salonga as shown in the final day of the Blind Auditions of ABS-CBN's top-rating and Twitter-trending vocal competition "The Voice Kids" Philippines Season 2 on Sunday, July 19, 2015. Owen from Dinagat Islands sang Aerosmith's hit "Amazing." The young rocker picked Coach Sarah to be his mentor. He is the last artist to fill the 18-artist team of the Popstar Princess. On the same night, Coach Bamboo and Lea already recruited 18 artists each on their respective teams. 'The Voice Kids' Season 2 on Sunday dominates online conversations with '#TVK2FinalBlinds' among the trending topics nationwide and worldwide.